Note how the Grand Total for the [A * B] calculated measure is 12*16=192, and not 12+12+12+12=48. This is expected behaviour for calculated measures, and indeed the way you want your calculations to behave most of the time. However, there are some scenarios where you want to do the calculation first and then aggregate up the result of that calculation; in our previous example that means you’d get 48 for the Grand Total instead. Currency conversion and weighted averages are common examples of calculations where this needs to happen. How can you handle this in MDX? Now, let’s say that once again you want to calculate the value of A*B at the Date and Product granularity, and aggregate the result up. Probably the easiest way of handling this would be to do the calculation in the fact table, or in the DSV, and then bringing the result in as a new real measure. However this may not be possible with some types of calculation, or if the granularity that you want to do the calculation is not the same as the granularity of the fact table. The big problem with this approach (apart from the fact that it may break when you do a multi-select in certain client tools – but you could work around that) is that it is usually very, very slow indeed. Depending on the calculation, it may be unusably slow. So you need a different approach. This is where scoped assignments come in. If you make a scoped assignment to a real measure, as opposed to a calculated measure, then the value of the assignment will aggregate up outside of the original scope. So, in this case, since you want the calculation to take place at the Date and Product granularity, if you scope on a real measure at that granularity the result of the calculation will aggregate up automatically. One very important thing to notice: the sets I’ve used for scoping on the Dates and Products do not include the All Member: for example, [Date].[Date].[Date].MEMBERS. If you use a set that includes the All Member, such as [Date]. [Date].MEMBERS, the calculation will not aggregate up correctly. This is going to be much more efficient than the pure MDX calculated measure approach, though just how well the calculation performs will depend on the complexity of the calculation and the size of the area that you are scoping on. Checking your blog is my daily work just like checking emails. I would like to see all your posts whether it is a new topic or a repeated one. Personally, I think your explanation is straight forward, clear and precise. It helps me learn new things as well as remember “already know but nearly forgot” stuff. I’m looking forward to seeing your MDX course in Sydney. I have calculated memebrs in my cube like this. – I created dummy columns in my named queries like “calc memb profit”, “calc memb profit2”, “calc memb profit3” etc.. with value as 0. Can you please suggest how can I improve performance for these queries. Thanks a lot for your response chris. I have defined dummy columns in named query SQL, not used new named calculation wizard. If define them as new named calculation, will there be any improvement in performance or both are one and the same. Hi chris, Thanks a million.. Your null suggestion has improved performance by 80%. I have been struggling with this issue for the past 2 weeks and now its almost fixed. Thanks to you from the bottom of my heart. I like the idea of using named calculations in the DSV for the new measure; in the past I have created an empty table in the RDB as a source for empty measures to use in scope assignments, but I think the DSV is a better approach. I also concur with George Qiao’s comments. So glad you took the time to blog this Chris. I have a member from 2 big fact table measures that, I thought, was going to require pre-aggregating and consolidating in the RDBMS (complete redesign). This is a much better solution than the ones I’ve (unsuccessfully) tried implementing the past few days. Most were similar to your calculated member example and were either SLOW or didn’t cover all scopes. This is simple and it preforms extremely well! I tried to do a test creating a NAMED CALCULATION in DSV and then a real measure basis on it. 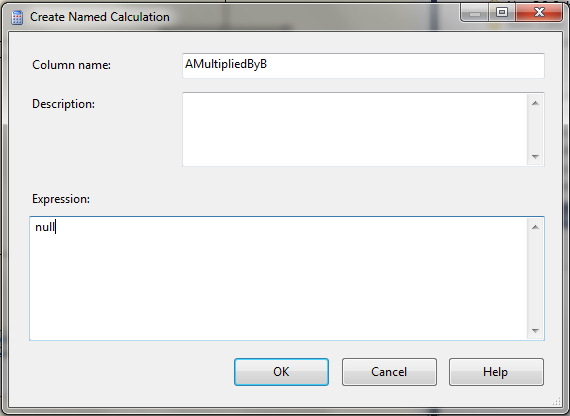 But i have problems with creating NAMED CALCULATION.. I have SQL SERVER 2008 R2 Standard Version..
Is it possibile to creare a NAMED CALCULATION in DSV also with this version ??? I do not think so ,,,,Icon in DSV Designer is not active..!!!! So I tried to insert that named calcolation manually inside the query of fact table…as below..
Is it a problem of SSAS ‘Version ??? No, it’s not a problem with the version of SSAS – all versions and editions allow you to create named calculations in the DSV. Something else must be wrong? Do you know if there is an easy way to control solve order if you have a number of these named calculations? If I create a calculated measure then the totals are wrong. Now I understand why this is but if I scope the calculation then I can only view the correct aggregation at that scoped level, which makes sense. So how can I create custom calculated measures where I can get the correct total but avoid having to restrict users to slicing by specified attributes to get the total to work. It seems to me like Microsoft have really fallen short of the mark here in terms of implementation of totals. They should really offer the ability to do this special scoping for specific cases but also offer the ability to calculate the total based on the data delivered to the cube ( making the total separate from the cube space ). I don’t know if I am missing something crucial but it just seems as though a calculation involving various measures is far too complicated that what it should be. Secondly I would like to ask a question: Can you explain why your proposed solution here requires an “empty measure” in the physical data model? I have a scenario where the physical data model and DSV are outside of my control (at least directly; I can create new user-definded objects in the DSV but not edit existing ones). Is there another way I can use your solution, which does not require making changes to the source tabel or DSV? Actually there are a lot of good reasons not to pre-calculate calculations like this – it would make the cube very large and processing very slow in a lot of cases. This solution needs an empty, physical measure because it does not do any of the aggregation in MDX – it relies on way that physical measures aggregate up automatically. This is much faster than aggregating the result of the calculation in MDX. There is no way of using this approach without making changes to the source table or DSV, but if you can create new objects in the DSV you can create a named calculation that returns null and use that for your measure. Great. So I can use an object from a DSV object other than the actual datasource? For example create a new DSV object called “ChrissRules” and use that in my Scope definition? Does the object need to be related to the datasource object? I’m not quite sure what you’re saying here – you do not want to create a new Data Source VIew, but you can create a new named calculation in your existing DSV and build your measure from that. A DSV is not the same thing as a data source. Yes, I understand now, thanks! To add a new measure to an existing measure group, your named calculation needs to be on the named query that your measure group uses. If your DSV is machine generated, that will be a problem. Firs of all thanks for the help you are providing to community. now it calculates cumulative correctly but only on the date level when I select another level it shows NA. Can you please advise how It can be done for all the date levels and all the time hierarchies. This should give you the cumulative sum without the 19000101 date and avoids the need for a scoped assignment. I have created a flag on date dimension and set its value true for 19000101 and false for all the other dates. it is showing nulls every where for both Calendar Dates and Calendar Weeks hierarchies. I have already tried to remove the calender weeks hierarchy bu the result was same. I’m assuming here that the attribute hierarchy that the date level of your Calendar Dates user hierarchy is based on is called [Contract End Date]. [Contract End Date]. I have tried this solution it gives correct cumulative on the date level but again nulls on all other levels. I have seven role playing dimensions I just showed three above for understanding purpose. I have checked separate measures and they are working fine but not one measure for all. Do you see any possibility for this or its better to use separate measures for each role playing dimension. I recommend you create separate measures for each role playing dimension – that will keep things simple, and you would get some potentially strange results if you tried to create one measure for all your dimensions. I’m having he following problem. I have two fileds C8 and C9 and i have a calculation AvgAbandonTime=C8/C9. There is a location dimension and it gives me the values based off it. Please see the data set below. But in the grand total insted of the average its giving me sum(c8)/sum(c9). Then i followed your process. Created a real measure in the DSV and followed the above procedure, but still getting the same result. How it will work with Parent-Child Hierarchy? It should work fine with a parent-child hierarchy, you just need to scope on the key attribute of the dimension. I need to add Customer dimension to have the same behaviour as item. How do I add this into the scope. Hi Chris and thank you for your quick answer. I really appreciate it since this is kind of an urgent issue. Your recommendation will work fine if user chooses date, client and product at the same time. What I want is to give them ability to use either date – client or date – item option and aggregate total on both levels. In this case it does not provide correct result. What my code should do is aggregate from the date, client *and* product granularity in all cases, regardless of what is chosen. I think what you want is to aggregate from client only if client is chosen, but this means you run into a common problem with advanced MDX calculations: something is always chosen from a hierarchy all the time! For this reason I always recommend to my customers that trying to write calculations that do something different depending on what has been chosen should be avoided: it is possible to do this up to a point, but the code is complex, usually slow, and the results turn out to be confusing for end users. It’s better to have different calculations for different scenarios. Hm, I need exactly the same behaviour regardless of what user selected (date, client and / or item). I did some testing and it did not look right. Will probably need to do more testing. I think I got you. I should have 2 calculations then. One for Date / Client scope and another for Date / Item scope right? Is the second scope overwrites the first one. then the scope mdx doesn’t seem to work. It is possible to write an assignment that does a calculation on two measures from different fact tables. What do you want to do though? I also need product of measures available in the two fact tables. I can create a 3rd fact table based on the 2 existing fact tables but that would create a very big catesian product fact table, which is what I want to avoid. These calculated measures can be seen from all dimensions. Should the scope statement you have mentioned include all the attributes of all the dimensions as users will be using them from the pivot fields? Can you please suggest an approach? You could use the Leaves() function here, but in this case why don’t you just calculate the values in your fact table in SQL Server (or whatever RDBMS you’re using)? It would give you the same result. But does every calculated measure need to be created in sql server or dsv. In my case the calculated measure depends on two different fact tables. Can the cube not handle this via MDX? No, certainly not – it’s only in the special cases that this post describes that you need to create calculations in this way. Most calculated measures in MDX are calculated after the real measures have been aggregated – only a few types of calculation need to be aggregated after the calculation has taken place. Chris, Thanks for this magnificent post as usual, I’ve really benefited from it. However I couldn’t understand why to use a real measure not a calculated measure. That part of the post was not clear to me. would you please explain it more? especially what do you mean by “the value of the assignment will aggregate up outside of the original scope” ? what is the original scope? can you please make it simpler? It has to be a real measure because only real measures aggregate up – calculated measures don’t. Think of a very simple hierarchy with an All Member and two members, A and B, beneath it. For a real measure, the All Member is the aggregated value of A and B; this is not the case for a calculated measure. To answer the second part of your question, using the same hierarchy as in the previous paragraph, if you create a scoped assignment on member A then for a real measure the All Member’s value will change so that it is still the aggregated value of A and B. Is this what do you mean? and, does any case (real or calculated measure) has better performance? Yes, you are completely correct. Regarding performance, the calculated measure will perform better because it is doing less work. nice post Chris! I’ve recently created a new SSAS cube with SSDT 2012 against SQL2012 and got the red squiggly line under the first word of “scope” (like your screenshot in your post). Due to this problem, the cube can’t be deployed. If I copy the same scope statement to SSDT 2010, it seems no problems. I don’t know have you run into this issue before, I can’t image I am the only one has this problems, not sure if I should use SSDT 2010 instead of SSDT 2012. Thanks. I’ve never been prevented from deploying by a bug like this. What error message do you see from SSDT? Are you sure there isn’t a syntax error somewhere? Pretty new to MDX here and have found you’re blog to be great reading and very helpful. I have a weighted average calculation that does ((A * B ) / A) but only where A is greater than 0. I’ve been trying to determine if I can leverage what you did with the SCOPE statement but I’m having trouble with excluding the data I don’t want included in the calculation. Can I do that with what you demonstrated above or am I barking up the wrong tree? I forgot to mention that B is actually the result of two other measures being divided to get a percent (B = C / D). After being sidelined by another project, I’m back trying to get my weighted calculation to work. I think I’m close but my weighted average ends up as a sum instead of a percent. I’m probably missing something obvious. Volume is in a different fact table than the inspection data. Average Quality (AQ) is defined as P / I. I created a calculation in the cube for this. Weighted Average Quality (WA) is defined as ((V * AQ) / V) where there is an AQ value. I’ve created this as a measure in the source. There is not ALL member at this hierarchy level [Date].[YQM]. [Date ID]. The Weighted Average I get for the sample above is 175.00%. Can you help point me in the direction of what I’m doing wrong. Should I be using the SCOPE on the component pieces to exclude the rows I don’t want as part of the Weighted Average? Also, can you recommend a better way to test SCOPE statements outside of reprocessing the cube? It doesn’t seen to work with SSMS. The calculated measure WA1 should give you the result you need. Chris I have a calculated measure that returns an average price by dividing an amount measure by a quantity measure. The value of the calculated measure is correct at the day level but not for the total for the month because its actually showing the average of the daily calculated measure members rather than the result of the average price calculation using the totals of the amount and quantity measures for the whole period? Chris thank you for your response. It turned out that I had an error in my calculation and once I had corrected it the normal aggregation behavior returned the correct results. During the process of resolving my issue I watched one of your webcasts where you used a “Deploy script” button to push calculations to the cube without having to do a full deploy and process of the project. After doing a little more research I found that this functionality is part of “BIDS Helper” and available for download from Codeplex. This discovery was invaluable as it made it so much easier to debug the calculated measure script. So thanks again for your help and please keep up the excellent work! I don’t have many experience in MDX and starting in this new world I have learned too much from your blog in order to solve many problems that I have found during the process and want to give the thanks for excelent work that you have done. – A dummy “Real” measure into the Revenue Fact table (in the dsv) to calculate the Revenue not planed (by city) using Scope, this is called “NotPlannedRevenue” with null like default value. Later using Scope I have calculated the values in order to get correctly Totals Values over the a Geography hierarchy which is working properly. The “Totals” are well calculated, but the issue is when I filter Cities from the Geography dimension, the total values are not being calculated using only the selected cities, it use all the cities from the fact table. I have problems in the totals by City, State, Country. I appreciate your help to solve the way which I must write this MDX or maybe I have to use another strategy., Thanks! Chris as you suggested on Microsoft forum, I removed 2 SCOPE statements (on the All members of City and Country) and the calculation works properly. I.e., I simply assign [Amount EUR] to [Amount]. Is this a good way? I mean, would it affect performance anyhow? For example, if one of the users selected EUR as reporting currency, and another one selected Local currency at the same time in some report? What happens in the cube in this case? I have never seen any explanation for such cases, so I do not know if it is right or wrong way. There is always going to be some overhead using scoped assignments or indeed any MDX calculation, but this is very simple so you probably won’t notice any overhead. You will need to make sure that the IsAggregatable property is set to false on the Reporting Currency hierarchy, though. Why do you scope on Measures.Amount twice? You can probably delete the second scope statement. Wow, that was fast! Thank for explanation. I have a double scope on Measures.Amount because it is similar to what BI wizard offers when doing currency conversion in the cube. I could never understand, why it wants to scope twice on measures, but thanks anyway for pointing out. Is ETL way better than doing currency conversion in the cube? Yes, if you are doing many-to-one currency conversion, doing the conversion in ETL is the right thing to do – it will give you faster query performance than if you did it in MDX. This scopes on the All Member on the Tier hierarchy and the SALE measure, and replaces the value with the result of the calculation. Thanks so much for your help. I figured I would need to do the sums via the SCOPE and then apply the formula but you saved me a lot of trial and error. Means last non empty value of particular Item . It would be hard to provide a sample query (over what’s in the blog post) without having access to your cube. IIF (Country.CurrentMember = US, Measure X, Measure Y). It works only for the Country level, but when the aggregations is in ALL level or another Level like Sub-Geo, the calculated member always use Measure Y.
I’m pretty sure that the explained solution would work as well for my case but I don’t retrieve the expected result. First of all, the model is as follow: 1 fact table “Sales”, 1 regular dimension “Product”, 1 intermediate fact table “Product_Market” and 1 many to many dimension “Market”. The fact table “Sales” contains a measure “Quantity” that we need to mutliply by the measure “Factor” from the intermediate fact table. FYI: The factor can be different for the set Product-Market. This is why we do not have the “Factor” measure in the “Sales” fact table. Could you tell me whether your proposed solution can work with a many to many? Yes, it should work I think; your calculation is basically the same as a currency conversion. If you’re using Enterprise Edition you’ll find it’s much easier to use Measure Expressions for your calculation if it’s just a simple multiplication or division. we have implemented the proposed solution but we are fuguring out a behaviour that we cannot explained sa far. Maybe could you read the below SCOPE and tell me whether you see what the root cause would be. Thanks in advance. What I understood from your explanation it that using sets for scoping on the Sales date and Product market must not include the All Member. SO the 1st SCOPE statement should meet this requirement where the second not. What we do not understand is why the first statement returns 0. The first MDX should be correct – each of the hierarchies used is an attribute hierarchy, isn’t it? Also, [Measures]. [Unit Multipliedby Factor] must *not* be a calculated measure. The attribute hierarchies are well used in the first MDX. [Measures]. [Unit Multipliedby Factor] is a measure in the Sales Measure Group. Not a measure in the Calculations tab. We continue the investigation…data type requirement? Again, I have a problem that requires a non-trivial approach with scoped assignments. The situation is following: I have a single measure Saldo (Sum) and Countries dimension in my cube. The Countries dimension contains plain country members, and also a Group member, which contains the sum of all countries. Of course regular [All] member contains duplicate amount if i select any country and Group member, because Group already includes this country. 1) If Group member is selected (rows, columns, filter), the total for Saldo should be equal to the Group member value. 2) If Group member is not selected, the total for Saldo should be equal to sum of selected countries. #2 works fine, but how to make #1 work as I want? Is that possible with scoped assignments? Let me illustrate #1 and #2. Of course, i can change dimension design and make it parent-child, but I would like to avoid it, because I’m not the original developer. I found the solution, may be useful to someone. Which basically means that if a Group member is selected, [Measures]. [Group Detected] equals 1 on [All] level as well. Which means that i check if Group member is in selection and set Total for Countries to Group Saldo in this case. I need one calculated member in my cube below i the scenario please help me. Is there any way to write conditions for Dimension attributes in MDX ? Is there any way to write less than and greater than conditions for Dimension attributes in MDX ? I have a question please which I think this post answers but I wanted to check. I have 2 fact tables at different grains and need to create a calculated measure using them both. My calculated measure = AvailableMinutes/ProductiveHours. No need to create a named query or any regular measures. Thanks Chris, that was a great help. So, looking at my Dimension Usage tab, the Employee dimension is referenced by both the Productive Time and Call Summary measure groups but then the Rosters dimension only references the Productive Time and the Call Date dimension only references the Call Summary. Is that the problem ? Does a calculated member, that uses measures from 2 different measure groups, need to be scoped only to a dimension that also references both measure groups? I have tried to write 2 separate scope statements and scope at different levels but cant seem to get it to work. 1. My Roster dimension is now related to my Call Summary measure group via my Call Dates dimension. Doesnt seem correct to be doing that. 2. My Date dimension that is role playing as a Call Date dimension is now linked to my Roster Start Date. I dont want a seperate date dimension for my Roster Start Date and if i did, i would add the Date dimension as another role playing dimension of ‘Roster Start Date’….but it seems i would not be able to do this and have my calculation work. There is something I am not understanding here…..feels like I am starting to hack this together instead of doing it properly. A reference dimension shouldn’t be necessary here. What were the relationships before? The relationships circled in red is what I have newly defined to get the calculation to work. When i included the below measure in my query execution time jumped by 2 hrs. How to rewrite the below measure. It’s hard to say. My guess is that it’s the Median() function that is making things slow, but there’s probably no way of replacing it. Hell people, i have a problem that needs very urgent help. The Distinctcount calculated member cannot be created because its parent is at the lowest level in the Title hierarchy. I think there’s a typo in your code: you have written [Measure]. [Distinctcount] and you probably should have written [Measures]. [Distinctcount] if you wanted to create a calculated measure. Above code works fine when corresponding dimension attributes are dragged in browsing pane but do not work when added to filter pane.Problem is I believe there is no way to know the attributes selected in filter pane in multidimensional cube. But I guess DAX function ‘IsFiltered’ identifies whether an attribute in being filtered or not. Is there an equivalent function in MDX ? Or, is there any other way of doing this ? I’m attempting to replace measure values in the fourth level of a parent-child hierarchy via a case statement, but the subtotal of the third level is displaying the total as if the values were not being replaced even though the subtotal of the fourth level aggregates as expected. Any idea as to what I’m missing? Thanks so much for your help! Is that what you actually have? There are brackets missing here for a start, so I would be surprised if this worked. I’m also noticing that the case statement order determines the overall subtotal of level 3. For example, if I put the case for the beginning balance measure first, the subtotal equals the value of the beginning balance cells at that level. Could it be something wrong with the case statement? I must have not replied directly to your comment and created a new comment below. Sorry about that. Sorry about that. I do have the brackets around the scope statements. MDX Studio stripped them out when I formatted the query. The aggregations work fine going up to the first level. The subtotal is only off on the third level subtotal where i’m replacing the measures. Balance sheet is a ‘dummy’ measure as per your example above. However, Beginning balance and Ending balance are calculated measures. Net change is a real measure. Thanks for the help! Thanks Chris. That’s what I originally had my scope assignments set to but the calculation stopped working once I associated the parent child hierarchy to the fact table via a many-to-many relationship since i wanted to add another parent-child hierarchy to the same dimension (income statement). I ended up creating two views on top of the physical hierarchy dimension table and relating those to the fact table individually via foreign keys and the scoped assignments evaluated correctly again. Are you aware of issues with scope assignments on a referenced referenced measure via a bridge table? Thanks again for your help. Ah, yes I think the m2m relationship will change things – the presence of a m2m relationship will stop a measure being additive. I’m sorry, I don’t understand what you want to do here properly. I just wanted to remove the “1234 abc 1992 2007 124 ” record when i was selected 2015 as planyear. Please suggest on this requirement. I’m still confused, sorry – are we talking about SSAS here or Power Pivot? Or are you consuming data from SSAS Multidimensional in Power Pivot? If so, why? Chris, this seems to be the best method for Same Store Sales calculations. I’ve seen some other approaches suggested but this is so much simpler. I’m scoping at the Store member level (excluding the All) and using Lag to check if data exists in both month and prior month (and year and prior year) on the data hierarchy for instance and not setting the measures to Null. Thank you! — Date Hierarchy – handy indicators / measure “bits” for reference in calculations; What level of the Calendar or Fiscal hierarchies are we at (Year, Half, Quarter, Month)? in those calculations totaling up correctly (we only include in totals if sales were in both periods). Hi Eric, I can’t say I’ve done more than take a quick look, but this seems reasonable. You can probably simplify it a lot more though by replacing all of those CASE statements to check what level you’re at with more SCOPE statements to handle the same logic. I have a problem regarding grand total.In my scope i am not using any measures which was already scoped and without measures its not giving correct grand total.Can you please suggest any other approach to achieve. Is [Amount] a calculated measure or a regular measure? If it’s a calculated measure, then that explains why you don’t see the totals you are expecting. As the blog post explains, you will need to create a regular measure for this to work. Thanks for responses.Unfortunately we have multiple calculated measures which are associated with dimension ‘scienario’ which I am using with ‘scope’ definition. Please let me know if any way to achieve grand total with scope definition. No, you can’t do it with calculated measures. As the blog post says, you have to create regular measures instead of calculated measures and use scope statements on them. I have the same problem with a cube that i’m running and i cant figure how to resolve it. My cube consists of several dimensions and a single Measure. The goal is to calculate the selling price, which is simply: Unit Price * Number of Units. The unit price and the number of units are attributes of a dimension, and their values can be retrieved directly from the database. Know that all the Scope members are hierarchies. And this happens only when a Product contains 2 Sub Products. Otherwise it work perfectly. Which is not correct, the grand total of Selling Price must be 50, not 100. If you have any idea how to figure this out, it could be very helpful. Do you have a Sub Product attribute on your dimension? If so, you should be scoping at that level and not Product. I have an below MDX Scope assignment I am having issues with. Sales Quota measure is at the Quarter level and to allocate the values at the month level, parent member is divided by 3. What if the Current member is at the day level and parent member is at month level & I want to get the equal allocation at the day level. Hi Bhavesh, it sounds like you need a measure that counts the number of days in the current month. Why not build a measure group from your Date dimension table with a simple count measure? Assuming this measure is called [Count of Days], you can then use a tuple like (Measures. [Count Of Days], [Posting Date]. [Date YQMD].CurrentMember.Parent) to get the number of days in the current month at the day level. Thank you very much. You are amazing & great. This has solved my problem. Hi Chris, I want to do exactly this but everywhere I look for a solution on leaf level aggregation it’s always scoped for a specific set of attribute hierarchys/granularity, for example in this case it’s for date and product attribute hierarchys. What I really want to do is say for a particular measure group, for a calculated measure (based on a combination of measure group measures) I want the result to be aggregated from the leaf level always, irrespective of what dimensional attributes I slice or filter by. As long as the dimension is related to the measure group through dimension usage, that measure will be aggregated from the leaf level always. Do I have to manually scope in every dimension attribute to do this or is there an easier way? Doing it in the DSV is not an option so I want to do this with a calculated measure. Basically I want to achieve the same thing as a MeasureExpression (for a “real” measure in a measure group based on a dsv Fact attribute) but with a calculated measure using MDX. It seems like it should be so simple but I can’t seem to find anything that works more elegantly than simply scoping for every dimension attribute I wish to slice by. Thanks in advance. Sorry when I said doing it in the DSV is not an option I meant the calculation itself, creating a null value like you have above is no problem, just the calculation needs to happen with MDX. I thought this was the answer to my problems, as it seems to imply that you can pass the measure group to the leaves function, specify your measure you want to leaf level aggregate and off you go. unfortunately I couldn’t get it to work it wants a dimension passed to it which is akin to having to scope key attributes individually. Finally, from the link you have given me MS seems to mention nothing of the sort it insists on a dimension being passed, if it is absent it brings back all leaf members of the cube which is not useful either. So I guess it would be good to know if this function was in fact intended to do what I need to do, cause from what I tried I couldn’t get it to work, or any other approach for that matter. Sorry just to clarify when I said is “akin to having to spoke key attributes individually” not quite, less work, instead of every key attribute you would have to cover every dimension related to the measure group–>Measure in question. thanks Des. What should happen here is that LEAVES(), when used in a nested scope statement, picks up the current context and returns a subcube which is all of the leaf members on all the hierarchies of all the dimensions relating to the measures in the current scope. If you have measures from different measure groups with different granularities you’ll get an error. But as I said, I’m not 100% sure of this and I’ll try to do some testing of my own. I would be interested to know if it works for you. Thanks for your insight Chris, I’ll give it a crack and let you know. Hi Chirs I tried it but it returned blank cells (null values). There is no errors and the script deploys without issue, it just doesn’t return anything. The base measure Y is a measure derived directly from a fact table in the dsv the aggregation type of that measure is defined as count. Hi Des, this is probably because you are scoping on a calculated measure and not a real measure. With this code I would only expect values to be visible if you select members at the lowest granularity of every single dimension related to the measure group. Can you try creating a real measure and scoping on that, as shown in the blog post? Ok no problem I’ll try that and let you know. I haven’t forgotten about this some things have come up is all I will post back shortly. thanks Des. There aggregation of the TestLeafRollUp Measure occurs as would be expected. The problem is that the leaf level figure is not correct to start with and I am not sure how the figure is being calculated. To clarify when I say correct, I would expect Ratio Measure and TestLeafRollUp measure values to be the same at the leaf/most granular level which in this case is day. I would expect the “traditional” aggregated measure “Ratio Measure” figure for January 2008 to be as it is, 3167.092 (175,320,715.13/55357) and for the leaf level aggregated measure TestLeafRollUp I would expect to see a total figure for Jan 2008 of 69282.55, equal to all the days in the month summed. everything should roll up from there in the same manner. The values are however very different, the incorrect leaf level figures are being rolled up and aggregated correctly but because the figures themselves are not correct the desired result is not achieved. It’s almost as if at the leaf level the implicit calendar hierarchy filters aren’t being applied to the values. Further investigation of the actual query that is being issued to the engine might shed further light on this but at this stage it doesn’t seem to do what I want. Just to be clear, you only have one dimension- the Date dimension- that has a relationship with this measure group, right? No there are other dimensions. In the original post was trying to find a way to do this without explicitly having to scope in every one of them. Yes, so I think maybe you are misunderstanding what scoping on each one of them means. In your first post today your query only shows data at the day level, but the scope statement you have using the LEAVES() function scopes at the lowest granularity of all the dimensions in the measure group, not just the Date dimension. Your test query will only show the same values for RatioMeasure and TestLeafRollup when you have a query that shows data not just at the Date granularity but Date *and* the lowest granularity of all the other dimensions as well. I just realized that the data doesn’t paste into excel ok after you make the post…….. If you want I can email them too you. That makes sense because days can have multiple values that when combined with other lowest grain members of other dimensions, they will then aggregate. I don’t want to have to bring in all the other dimension lowest grain attributes though. I just want the two measures to behave exactly the same, so in this case same values at the day level. The only difference is in the way in which they aggregate. Is it possible to achieve? SCOPE [Region].[RegionName]. [RegionName].MEMBERS in the scope statement which after testing also gives the desired aggregation result. If I do this for every potential attribute I wish to use in any subsequent queries where I want the TestLeafRollUp measure to aggregate as outlined above it works, it’s just cumbersome to add them all individually, I was wondering if there was any way around that. I guess then it has to be done this way. Sorry, I know it feels like we’re going round in circles a bit. However the reason I made my last comment is that if you do scope on all the attributes separately (eg if there were only two dimensions, Date and Region, and you scoped on [Date].[Date]. [Date].MEMBERS and [Region].[RegionName]. [RegionName].MEMBERS), you would not get the results you said you were expecting in your last post either with TestLeafRollup and RatioMeasure returning the same values when you run a query that only looks at Date values. OK thanks for you help with this Chris, I managed to put the pieces together here and get the results I required. thanks Des. I am new to this software (Jet Analytics) that I am using and i think it deals with MDX expression for some custom choices of setup when a designer is creating measures. In my case, i have created a standard measure which pulls data from a source column in a data warehouse object. The measure works and display values when report is generated, however, when i got to check the grand total of the said measure. it is different with what the excel is calculating. Is there any way on how can i use MDX expression to just count what the pivot table values is showing in the report? total docket should be 11. Yes, it sounds like the technique described in this post will do what you want to do. Very well written and clear Chris! Would this approach work to fix my performance issue? Not exactly sure how I would approach this?